Are You And Your Kids Up To Date On All Hepatitis B Vaccinations? The reason we administer hepatitis B vaccinations to infants is because the virus is most serious if contracted as a baby or young child. The CDC advises all children between 12 months and 23 months be vaccinated for hepatitis B. The disease is sparked by a liver-attacking virus known to cause lifelong infection, liver cancer, liver failure, scarring of the liver (cirrhosis), and potentially even death. If a child or infant is infected with hepatitis B they are far more likely to develop chronic illnesses due to their condition. Symptoms may not surface for years after exposure but tend to be life altering when they do. The best way to prevent being infected with hepatitis B is to get the vaccine. Hepatitis A and B are members of the same closely related family of diseases that also include hepatitis C, D, and E. In general, hepatitis is linked with inflammation of the liver and is considered serious enough to be life threatening in certain cases. The Immunization Action Coalition and the CDC have reported some startling numbers regarding children and Hepatitis B. In the US alone there are 2,000 to 4,000 estimated deaths related to the disease, and 30-50% of these cases include people who were originally infected with the infection as a child. Some argue against vaccinating infants since Hepatitis B is filed under sexually transmitted diseases, but blood to blood contact can also provoke exposure. You must consider the real potential for your child to pick up Hepatitis B even out on the playground. Say for instance an infected child bites an unimmunized child. The possibilities are real but preventing it is simple. In some cases the vaccine may not be suitable for you. Tell your doctor if you or your child has had a previous reaction to a different strain of the vaccine, or if you are allergic to any of the vaccine ingredients such as yeast. When Are Hepatitis B Vaccinations Given? 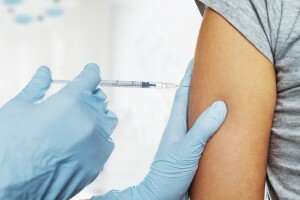 Children and adults are usually given the vaccine for Hepatitis B in three injections, the second shot given 1 month after the first and the third shot given 6 months after the first. All children should receive the hepatitis B vaccine when they are first born and should finish the entire series of vaccines between 6 and 18-months. Ordinarily if the vaccine is given at birth babies get their first shot at birth, second at 1 month and third at 6 months old. Children who did not get the vaccine at birth or who did not get all 4 shots are recommended to get catch-up vaccinations. There are often no symptoms when hepatitis B is first contracted and the chance for developing early symptoms will decrease as you get older. When symptoms do arise they include: joint pain, nausea, loss of appetite, yellowing of skin or eyes, frequent stomachaches, and unnatural tiredness. The younger someone is when they get hepatitis B the higher their risk for developing the worst problems associated with hepatitis B, such as liver cancer and scarring of the liver. You live with or are sexually active with someone that is positive for hepatitis B. You have more than one sexual partner. You have diabetes and are less than 60-years-old. You live in or travel to countries where hepatitis B is active. If you are planning to travel to an infected region you should get your vaccine at least one-month prior to traveling. Visit Urgent Medical Center today to get your hepatitis B vaccine!